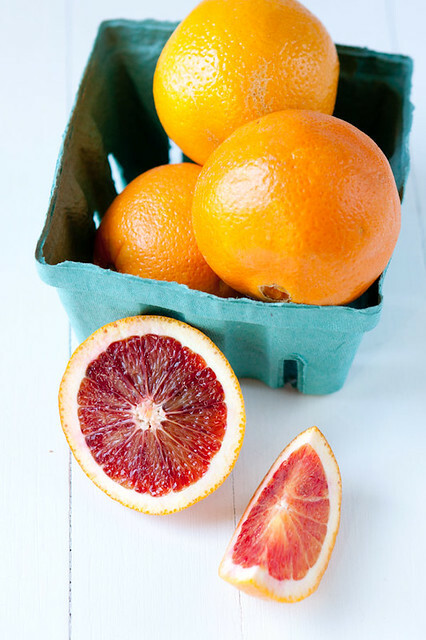 I know oranges are available year round but for some reason the only time I actually want to eat a whole orange is in the early months of year when my two favorite varieties are available: Cara Cara and Blood Oranges. When they show up at my grocery store I start hording them so I’ll be able to eat as many as possible before they disappear again. I haven’t been to the grocery in a few weeks, so when I went on Monday and saw they finally had blood oranges I grabbed a bunch and decided it was a sign that I had to make something delicious out of them. I was so energized by the idea that I found myself in the kitchen at 11pm later that night making these scones. If I had any regrets about staying up too late I forgot them as soon as I took a bite of one the next morning. As I said last fall, cream scones are the only way to go. All the scones I’ve tried to make without cream were dry and dense and almost inedible. After some searching I think I have finally found the ultimate cream scone recipe. I say ultimate, because they are literally all cream scones. There’s no butter, there’s no eggs, there’s just lots of sweet, sweet whipping cream and these scones are all the better for it. Heck, there’s hardly any sugar in the recipe, if it weren’t for all the cream it could practically be health food. I thought the lack of sugar and butter were going to result in dry scones but these are soft and fluffy and light. I even substituted some whole wheat flour for the white flour but other than the scones being a bit flatter than they were supposed to be the texture wasn’t really affected. I adapted to recipe to make use of my oranges by mixing in some of the zest and also making some more orange sugar to sprinkle on top. I also mixed in a bag of one of my favorite snacks, dried tart cherries, which compliments the orange flavor perfectly. This recipe is ridiculously easy—the less you handle the dough, the better these are going to be—and has very few ingredients so you could easily adapt it to use your favorite citrus and dried fruit mix-ins. I’m already planning a blueberry-lemon version. You could even replace all the citrus zest with a spice. Apple-cinnamon maybe? 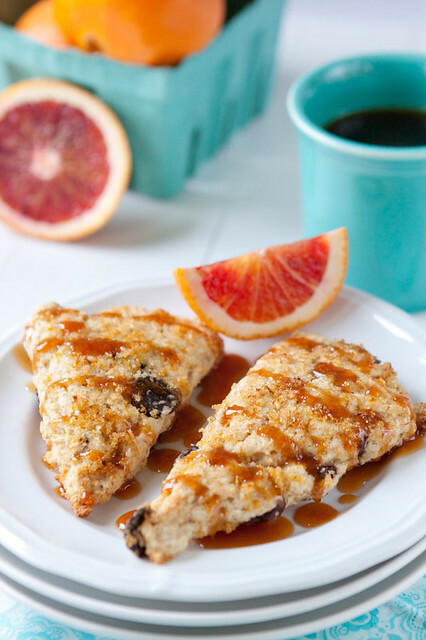 I really wanted to showcase those blood oranges so when I found this blood orange caramel sauce recipe I knew it would be a perfect way to finish these scones. I know it may seem like sugar overload to put a caramel sauce on top of something that is sprinkled with sugar but the scones only have 1/4 cup of sugar in them, so they are just barely sweet by themselves. As long as you drizzle the caramel on lightly it’s not overpowering at all. It’s sweet but the juice from the blood orange adds a wonderful tartness to it. It was hard to drizzle it on the scones and not just eat it by the spoonful! 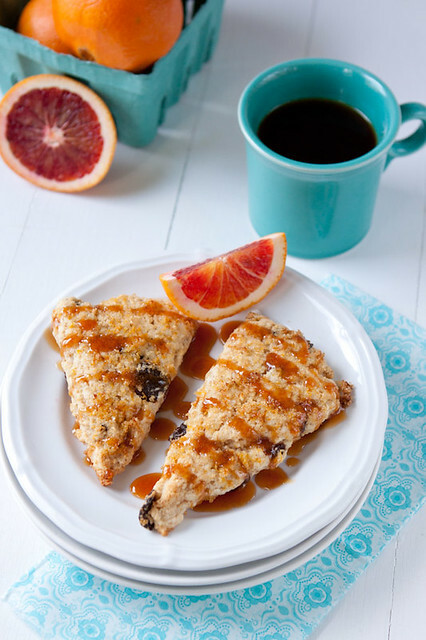 These scones still taste great with only the orange sugar on top so feel free to omit the caramel sauce but it’s a real treat if you want to make the effort for it. The way I know I finally found the perfect scone recipe is that my boyfriend loves them. This is a big deal because he hates scones. He’ll usually eat anything you put in front of him and doesn’t complain but we’ve actually had discussions about his hatred of scones because of how dry they are. When he grabbed one this afternoon I told him he’d hate it but he ate it quietly and then 10 minutes later went back for another. According to him, these can’t be scones because they’re actually good. I guess that’s the power of whipping cream. Using the wrong amount of flour can be the difference between light, fluffy scones and dense, hard ones so make sure to measure your flour the right way: fluff it with a spoon and then lightly spoon it into your measuring cup, finally use a knife to level it off. *I substituted 1 cup of all purpose flour with whole wheat pastry flour. I could tell the scones didn’t rise as much as they were supposed to but otherwise they were perfectly fine. First make the caramel; this can be made a day ahead of time. Add sugar and water to a small heavy-bottomed saucepan. Cook over medium heat; stir only until sugar is dissolved, then let the mixture come to a boil. If there are any sugar crystals on the sides of the pan try to wipe them out with a wet paper towel. Boil mixture until it starts turning brown, about 8 minutes. Turn the heat down to medium-low and continue to cook until the mixture turns a deep golden caramel, about 1-3 minutes more. DO NOT STIR. Very slowly pour the orange juice down the side of the pan. Be careful, the mixture will bubble and steam. Stir in the grated orange peel. Stir until the caramel is smooth. Remove from heat and let cool. If making this ahead of time, store the caramel in a container at room temperature. Gently heat it up over low heat or in the microwave for about 30 seconds right before serving. In a large bowl, mix together the flour, sugar, baking powder and salt. Stir in cherries and orange zest. Add cream and stir just until the dough starts sticking together. Turn it out onto a lightly floured surface and knead very gently until it holds together in a ball. The less you handle the dough, the better these scones will be. Form the dough into a 10-inch round, 1/2-inch thick disk. Slice into 12 wedges. Transfer the wedges to a large baking sheet, spaced at least an inch apart. Add the sugar and orange peel to a small bowl and mix together with your fingers. Brush the tops of the scones with the melted butter and sprinkle the orange sugar on top. Bake for 15 minutes or until light golden brown. Transfer to a rack to cool slightly. 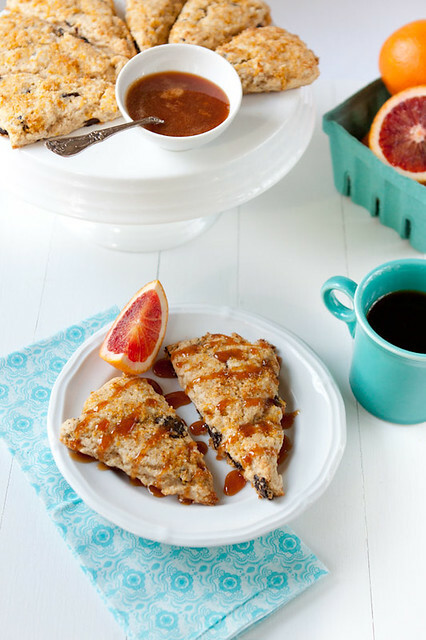 Serve warm or at room temperature, with warm Blood Orange Caramel Sauce drizzled on top. You can make these a day ahead. Let the scones cool completely and then wrap them in foil and store at room temperature until ready to serve. Aubrey recently posted…Arisaig, take two. Oooh, cream scones. You have me at hello. I’ve made cream biscuits before and have been very impressed with how moist they were, so I’m thinking you’re onto something with the all-cream scones. Love the addition of cherries and the caramel sauce.